In KDE 4, you can open a new window for Kate via “View -> New Window”. This won’t start a new application instance but just add an other Kate main window to the current instance (which shows the same documents & session & projects). This is kind of complex to handle internally and we think about dropping that behavior and instead launching just an other Kate application instance if you trigger that menu action. Pro: Easier code structure, less to maintain, less bugs. Each window is an own process, e.g. if one crashs, not the others die, too. Contra: You will loose the have the same documents open in two windows with syncing (as the two windows would then be individual processes). Any opinions about that out there in the lazy web? Feedback is welcome. 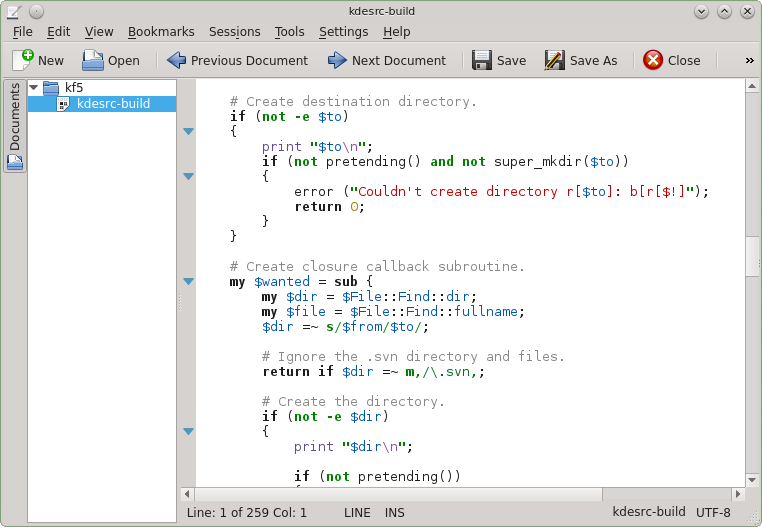 removed KTE::EditorChooser, since Kate Part is the only implementation since over 10 years. Just use KTE::Editor* editor = KTE::editor(); to get KatePart. Please feel free to join the porting fun. Just follow the Frameworks compile guide and checkout the git branch “frameworks” in the Kate git module. Greetings from the Kate land again. This time, Alex Turbov will spend a few words about his “C++/boost Style” indenter that is part of Kate Part for several releases. This indenter (initially) was designed to help code typing in a “boost::mpl” style (i.e. with leading comma in formatted (template) parameters list). One may read the rationale of such approach in the “C++ Template Metaprogramming: Concepts, Tools, and Techniques from Boost and Beyond” by David Abrahams and Aleksey Gurtovoy. It is really easy to miss a comma when invoke metafunctions and it usually leads to a lot of complicated compile errors. The indenting technique should help to visualize the control syntax and prevent stupid errors like missed commas. In practice I’ve noticed that this style can be used to format long function calls or even `for` statements. Actually everything that can be split into several lines could be formatted that way. And yes, it is convenient to have a delimiter (comma, semicolon, whatever) as a leading character to make it visually noticeable. Further improvements bring to the indenter some cute features and nowadays I’d prefer to consider it similar to a T9 (input method) for C++ coding, but not as a “real indenter” in contrast to others, shipped with kate out of the box :) Particularly this indenter “exploit” can see “impossible” syntax and (try to) transform it to something “reasonable” — i.e. just like T9 it tries to be a predictive. to start `doxygen` comment block use `/**` + ENTER. Every following ENTER just extend the current block. PS: The other things I’ve found useful when typing C++ code can be plugged with some Python plugins dedicated to C++.